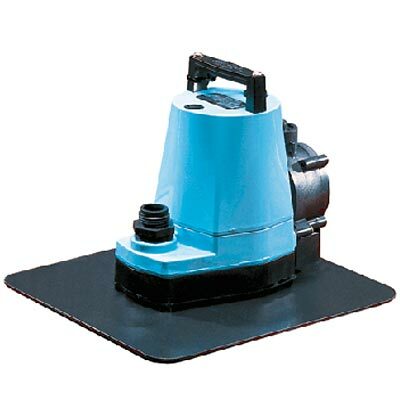 Easily remove water from your pool cover with the Little Giant Automatic Pool Cover Pump. This innovative pump is effective in removing standing water on your pool cover, to 0.5", with a bevy of safety features to protect you and your family. The included base plate helps spread the weight of the pump, preventing it from lowering the cover. The screen keeps debris out of the pump, protecting its components. The innovative dual plugs on this item allow it to be used either automatically or manually, by using one or both plugs. When using the pump manually, plug just the standard plug into a GFCI outlet. If the automatic setting is chosen, the pump will activate when water is approximately 2" to 3" high on the cover, and turn off when it has lowered to 0.5" to 1.5". The included discharge fitting accommodates a standard garden hose, and larger 1" tubing may be used in areas of high rainfall. For more versatility, submerge the item for use in your water garden. This pump features epoxy coated, die cast aluminum housing for corrosion and rust resistance, and the dielectric oil keeps the bearings lubricated. The 1/6 Hp motor is capable of turning 520 gallons per hour at 20 feet of head, for a thoroughly effective pump. Move water easily and quickly with the Little Giant Automatic Pool Cover Pump. One year limited warranty. Use this chart to determine the proper size pump for your application. The height of the water outlet above the water surface is called the Head Height. Gallons Per Hour (GPH) represents the maximum amount of water your pump is capable of pushing at a given Head Height. To ensure the pump's best possible performance, reduce frictional losses by using the largest diameter hose possible.